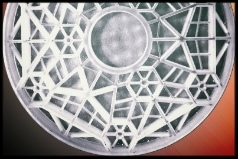 How does one grind, polish and figure telescope optics at home? 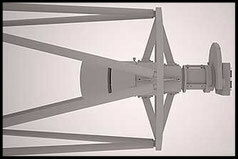 The observatory dome, telescope mount, optical tube assembly and instrumentation. Photographed only 21 degrees above the southern horizon in Namibia, this is a 2.5 x 2.5 degree area of the sky surrounding the Tarantula Nebula (center) in the Large Magellanic Cloud (lower right). Distance: 160 000 light years. This nebula gives rise to intense star birth, greater than any known emission nebula in the Local Group of galaxies. It has produced intense bursts of star formation over the last few tens of millions of years. Hodge 301 star cluster located about 150 light years away from the center of the Tarantula Nebula. Hodge 301 was formed approximately 20-25 million years ago. NGC 2070 open cluster located at the center of the Tarantula Nebula. The extremely massive stars it contains produce most of the ionizing radiation that illuminates the nebula. NGC 2060 star cluster approximately 10 million years old, discovered by John Herschel in 1836. N157B remnant of a supernova which occurred approximately 5000 years ago. SN 1987A Supernova which occurred 168,000 light-years ago. Its light reached Earth on February 23, 1987. NGC 2074 emission nebula with an embedded open star cluster. Detail of emission nebula IC 2944, "The Running Chicken", in Centaurus. Small dark patches in the center are cold gas (hydrogen and helium) and dust (silicates and carbon). Each patch is several hundred times larger than our solar system. Telescope: Skywatcher Esprit ED 120 mm f/7 apochromat, mount: AP-1200 GTO, camera: Apogee U16M, CCD-temperature -17 C, LRGB, L: 8x6min; R: 8x6min; G: 8x6min; B: 8x6min, CCD-temp = -17 C.
Eta Carinae Nebula. Six minutes sub-exposures in RGB. No luminance. Field of view 2.5 x 2.5 degrees. MaximDL user interface during an H-alpha exposure of the Heart Nebula. This image is exposed only 15-minutes at f/7. How many pixels would make up our solar system on this image of the center of the Heart Nebula? Answer: only 0.014 pixel ! Neptune's orbit is 499 light minutes in diameter. The camera has an image area of 4000 x 4000 pixels. The Heart Nebula's width, 200 light years, makes up approximately 3000 pixels across the original image, of which the image above is only a detail. One light year is then 15 pixels, so 499 light minutes is 0.014 pixel. 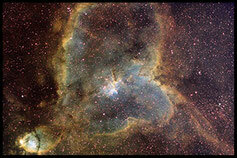 The young star cluster Melotte 15 was born of hydrogen, helium and heavier elements in the clouds of the Heart Nebula. The Heart Nebula, like most emission nebulas, is inflated like a bubble by newborn stars in its interior. The ionized gasses are mostly hydrogen, but are also rich in oxygen (blue) and sulphur (red), as well as all of the heavier elements fused in the cores of several generations of stars long dead. The ionized gasses are eroded by stellar winds and radiation from massive hot stars in the young star cluster Melotte 15, left of center, formed only 1.5 million years ago.